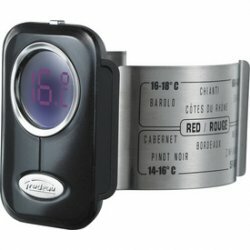 Trudeau - for the best enjoyment of your wine served at its ideal temperature. This thermometer is Stainless steel with a LCD strip on it for measuring temperature. This thermometer uses liquid crystal thermochromic ink which is formulated to change colour at different temperatures. It also features average serving temperatures for various wines listed around the perimeter. When the bar "lights" up to that level, the wine is ready to serve. Once removed from the bottle it will go back to being "dark" and is ready to use again. Stainless Steel- Satin Finish.